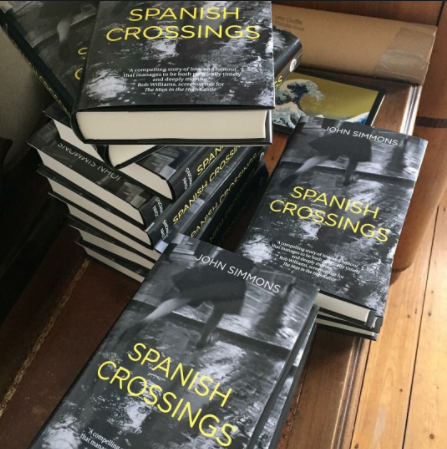 Dark Angels founder John Simmons has just published his second novel, Spanish Crossings, set during the Spanish Civil War. This began as a story written in Spain on a Dark Angels course in 2014. Mother declared herself happy. She had not liked Madrid. In her head it still rang with the steel clang of jackboots on the cobblestones. Standing in front of Picasso’s newly installed painting Guernica, paying silent homage, had left her tearful. Now we had moved south to Seville, and her mood lifted. Sometimes we rattled through the streets on trams but mostly we walked. Even in late September Seville was hot, the heat rising from the pavements as well as burning down from above. So our walking was strolling and our strolling was sitting in the gardens. Watching the world go by was what Mother did now, now that the world was passing her by. It seemed that way to me too, now that I was nearing my fortieth birthday. I had been a disappointment to Mother and Spain had been the reason for her disappointment. In her youth, her beliefs and her friendships had been defined by the Spanish Civil War. In north London, particularly in Hampstead, the war had raged fiercely through the weapons of words. I wish I had heard her then, in her prime. I was left with the black and white photos of a young woman with dark hair tied back and a raised clenched fist. “No paseran!” she shouted from the centre of her eccentric group of comrades. But I disappointed her. My political belief was warm leche compared to her hot cortado. What should I do with a degree in languages, with Spanish as my main study? Of course I came to Spain, and of course this was the 1970s with Franco still in power. I broke Mother’s forty year boycott of this country that, unseen, unvisited, she had loved despite the way it had disappointed her. Perhaps I took heart from that. Disappointments can be overcome. They do not need to last a lifetime. I came to Spain as a lowly link in the journalistic chain. I filed stories with a reporter’s objectivity – how Mother hated that – but with increasing excitement as Franco’s time also began to fade into the history of black and white photography. He died, I rejoiced, I held my breath. I joined the people on the streets as colour returned. I was there, with shots ringing out in parliament, watching the coup failing like a scene from an opera. Then I came home. By this time, Mother was frail. My father had long disappeared from the scene, unmentioned, unmentionable. I took it into my head to take Mother to Spain for her first experience of this country that had shaped her life. “That would be interesting,” she said. I wasn’t sure if this was a commitment. Her eyes were filming with age but there was a glint of her old spirit. So he had been mentioned. Perhaps this gave me a reason, apart from filial duty, for such a trip. I could walk in my father’s disappeared footsteps. After Madrid we took the train to Seville. Despite Mother’s rejection of the advance of age, there was no mistaking her frailty. She was in her seventies now, her skin wrinkled like overwashed fabric, her voice closer to a whisper than a shout, her gait hunched behind an invisible stick. I walked behind, to follow her pace and direction, not my own. And she gained energy day by day as we both orientated ourselves towards Seville. We stayed in the Hotel Doña Maria near the Cathedral. The bells tolled through the night but Mother never mentioned them. Her room was rather grand, with antique dark-wood furniture and devotional paintings. Not her taste, nor mine, but she could rest in the afternoons. The idea of siesta made more sense here. On our first morning we visited the cathedral. Mother was still shocked by its Catholicism, by the flaunting of its wealth through gold and silver. The statues of Christ, the paintings of the Virgin, allowed no questioning of faith. “I hate this place,” Mother whispered to herself, perhaps to me. She gravitated towards la juderia and Alcazar, instinctively on the side of the suppressed. But Jews and Muslims were not really present there. Their people had been swallowed by the past. She loved the barrio, wandering the narrow alleyways without fear while I looked shiftily over my shoulder in the gathering darkness. We could smell rather than see the oranges deep in the leaves. Sitting on a bench in Plaza Santa Cruz, among the rose bushes, she listened to the gypsy wails and rhythmic strumming of Flamenco players getting ready to perform. By daylight she inhaled the architecture of the tobacco factory, allowing herself a secret cigarette while humming songs from Carmen. Water trickled through the days, the trilling of fountains all over the city, the stifling air freshened by the wafting of a fan bought in a shop outside the Cathedral. So the days drifted by. We had set no time limit on our visit but I sensed it was nearing our time to move on. Perhaps Bilbao could no longer be avoided? It was in the Jardines de Murillo, outside the Alcazar walls, beneath the ancient, leafy trees, that Mother declared she was happy. It was a relief to me, more than I had expected. We said good night and wished each other sleep. I listened to the Cathedral bells marking the hours. In the morning, when Mother did not appear for breakfast, I knocked on her door but there was only silence. So I had to ask the hotel manager to open her room door. Her sleep was profound but at least, I consoled myself, she died happy.